carina schoen: sharing the love. I wrote this post about giving back over Christmas and asked you all to share your stories. Do you have one? I'd love to hear it. Nothing warms the heart like hearing about other people giving of themselves to those in need. Our main focus this year was the food bank. Lute's school had kids bring something in every day for a week, and my amazing grandmother asked that we give food to the food bank instead of giving her gifts for her birthday this year. Isn't she awesome? Another easy thing that we did - thanks to my husband and his love for purging - was rid ourselves of nearly half of the kids toys. They were gently used and will hopefully bless a whole mess of kids. There is a fantastic little ministry in our area that collects toys, diapers, clothes, formula, cribs, blankets - whatever a mother with young children might need. They have dozens of women come through weekly and we are proud to be part of such an incredible mission. Leave your story in the comments, or leave a link to your own post. I can't wait to hear how you gave back... it'll inspire us all, I'm sure of it. 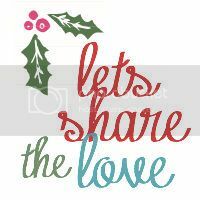 A post on how service learning with my students got me back into the holiday spirit this year. You have always inspired me with your gifts of giving. I love that you share it with others, because you help to inspire others to do more, and that is so beautiful. We also have organized a food drive at my husband's work for the past 3 Christmases, and this year we took 5300 lbs of food to our local food bank! It is the best feeling ever. Merry Christmas to your sweet family.